Almost every log home we design, supply and build is custom made. standard list of materials supplied subject to specifications and design. All of which come with BM TRADA ISO 9001 and FSC certification. ventilation slots.Sealed glass units + Argon gas – U value = 0.61. Inward opening – Tilt & Turn (Unless specified otherwise). Inc German fixings / handles (Silver grey). Complete unit in frame also made from laminated timber. Both Lasur coated with choice of 270 colours. Reinforced glass where relevant and smoked glass inWC / bath. Any size window – On request. External doors – Patio doors / windows same spec as above.Any size, Including 3 – point barrel locks and Oak thresholds. Velux windows – on request. handles, hinges & T-pieces. Set in frames. Timber architraves –- external + internal 18X90mm facia boards.For all of the above (items 1 to 4). Bitumen belt and building paper. Roof – Rafters 70mm X 220mm. 18mm T&G Sarking. Ridge beam -> 360mmX180mm Gluelam. Roof membrane + ventilation battens.T&G 11X88mm ceiling boards + ceiling skirting. Eaves boarding -> 18x140mm. Soffit boarding >18x95mm. Staircase – L shaped Nordic Spruce or Pine + railings and posts. Walls – Exterior and interior solid log walls from kiln-dried Spruce or Pine in square or oval profiles from 118mm to 240mm thickness and Laminated logs (On request). Including T-battens for openings, metal Screw-rods for log intersections, timber pegs dowels, hydro barrier strips and DPC Bitumen layer on foundations + anchor bolts. Insulation frame – For exterior walls (sliding frame) 45X195mm +Metal parts. 18mm timber log clad (same profile as exterior walls). Building accessories – External preservatives 2x coats water based (Remmers). Anchor bolts, metal straps & fixings, Silicone tubes & building foam, tapes, nails & screws, building paper, vapour barrier, bird / insect net, Bitumen DPC belt. Architect working drawings – (IN CAD + PDF) 2D floor plans,Elevations & foundations (Ex – site plan) to submit for planningPermission by your appointed agent. 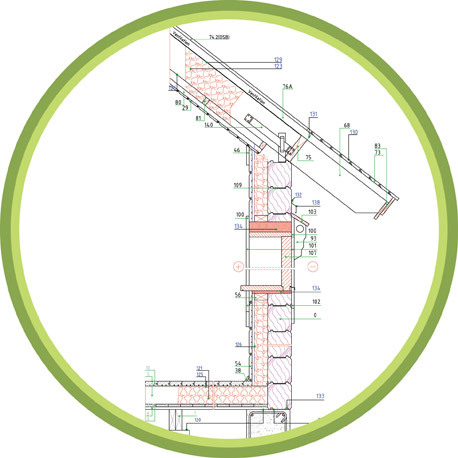 Technical working drawings – covering all construction elements including detailed cross sections for building warrant. (Ex SER & SAP certificates – by your agent / structural engineer). construction to wind and water tight stage – on request. structure on to your prepared foundations. Exterior + interior log walls. Ridge beam, rafters, Sarking + roof membrane. On site labour. Insulation, services to site. Professional fees for your appointed agent(s) re planning permission & building warrants(See items 13+14). To site by artic mega trailers (charged at cost). From contract to site delivery 8 weeks subject to T&C’s (On request).